Silvia Pessoa is an associate teaching professor of English at Carnegie Mellon University in Qatar where she teaches courses in academic reading and writing and sociolinguistics. Her research areas include academic writing development, second language writing, sociolinguistics, bilingualism, and immigration studies. Her research has been funded by the Qatar National Research Fund and has appeared in international journals such as the Journal of Second Language Writing, Linguistics and Education, and the Journal of Arab Studies. Silvia Pessoa's research areas include academic writing development, second language writing, and immigration, which she studies with the tools of systemic functional linguistics and qualitative methods. Through National Priorities Research Program (NPRP) grants from the Qatar National Research Fund (QNRF), she has studied academic writing development among linguistically and culturally diverse university students in Qatar, and has studied the life experiences of immigrant workers in Qatar. Pessoa, S. (2010). Undocumented Uruguayan immigrants: Biliteracy and educational experiences. San Antonio, TX: LFB Scholarly Publishing LLC (250 pages). Sacchi, F., Pessoa, S., & Martin Cabrera, L. (2005). Más allá de la pantalla: El mundo hispano a través del cine. Boston: Thompson/Heinle (272 pages). Choueiry, H., Pessoa, S., & Rajakumar, M. (Editors). (2010). Hazawi: Stories from Qatar. 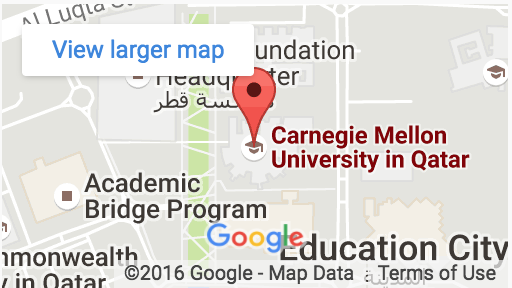 Doha, Qatar: Carnegie Mellon University in Qatar (150 pages). Gardner, A., Pessoa, S., & Harkness, L. (2014). Labor migrants and access to justice in contemporary Qatar. London: The London School of Economics and Political Sciences Middle East Center. Mitchell, T. D., Miller, R. T., & Pessoa, S. (in press). Longitudinal changes in use of Engagement in university history writing: A case study. In L. Lai, A. Mahboob, and P. Wang (Eds). Multiperspective studies of language: Theory and application (pp. 145-153). Beijing: Foreign Language Teaching and Research Press. Miller, R.T., Mitchell, T.D., & Pessoa, S. (2016). Impact of source text genre and prompts on students’ genre uptake. Journal of Second Language Writing 11, 11-24. Soudy, N., Pessoa, S., Dias, M.B., Joshi, S., Thowfeek, H. , Teves, H. (2015). The Brain Race game: Development, implementation, and impact. Proceedings of the 7th International Conference on Computer Supported Education (CSEDU-2015), 34-45. DOI: 10.5220/0005410400340045. Miller, R.T., Mitchell, T. D., & Pessoa, S. (2014). Valued voices: Students’ use of ENGAGEMENT in argumentative history writing. Linguistics and Education, 28, 107-120. Pessoa, S., Miller, R. T., Kaufer, D. (2014). Student challenges and development in the transition to college at an English-medium university in Qatar. International Review of Applied Linguistics in Language Teaching: Special issue on English-medium universities in non-English speaking countries, 52(2), 127-156. Pessoa, S., Harkness, L., & Gardner, A. (2014). Ethiopian migrant laborers and the free visa system in Qatar. Human Organizations, 23(2), 205-213. Gardner, A., Pessoa, S., Diop, A. Alghanim, K. Le Trung, K., & Harkness, L. (2013). A portrait of migrant workers in contemporary Qatar. Journal of Arab Studies, 1-17. Karatsolis, A., Pessoa, S., Papadopoulos, P., Reynolds, D., Karthikeyan, K. (2011). The language of sustainability: From the basic writing classroom to professional discourse. IEEE International Professional Communication Conference Proceedings, 1-11. Achugar, M., & Pessoa, S. (2009). The role of Spanish in an academic community: Power, place, and linguistic attitudes. Spanish in Context, 6(2), 199-223. Pessoa, S., Hendry, H., Donato, R., Tucker, G.R., & Lee, H. (2007). Content-based instruction in the foreign language classroom: A discourse perspective. Foreign Language Annals, 40(1), 68-87. Dominguez, R., & Pessoa, S. (2006). Early vs. late start: Documenting achievement. Foreign Language Annals, 38(4), 473-483. Gardner, A., Pessoa, S., Diop, A. Alghanim, K. Le Trung, K., & Harkness, L. (in press). A portrait of migrant workers in contemporary Qatar. Re-print from the Journal of Arab Studies (2013) to appear in I. Rajan and G. Zacharia Oommen (Eds. ), Asianisation of migrant workers in the Gulf countries. Cambridge, UK. Cambridge University Press. Miller, R. T., & Pessoa, S. (in press). A corpus-driven study of the learning of disciplinary genres. In L. Flowerdew & V. Brezina (Eds. ), Written and spoken learner corpora and their use in different contexts. London, Bloomsbury. Pessoa, S., & Miller, R. T. (in press). Implementing writing at an American branch campus in Qatar: Challenges, adaptations, & recommendations. In L. Arnold, A. Nebel, and L. Ronesi (Eds.). Writing research and pedagogy in the MENA region. Anderson, South Carolina: Parlor Press. Gardner, A., Pessoa, S., & Gardner, L. (2016). Migrants and justice in Qatar: Time, mobility, language and ethnography. In R. furman, G. Lamphear, and D. Epps (Eds.). Lived experiences in a transnational world (pp. 253-265). New York: Columbia University Press. Pessoa, S., Soudy, N., Gatti, N., & Dias, M. B. (2016). A community adult English literacy program for migrant workers in Qatar: Context-specific critical pedagogy & communicative language teaching at work. In C. Hastings & L. Jacob (Eds. ), Social justice in English language teaching (pp. 289-305). Arlington, VA: Teachers of English to Speakers of Other Languages (TESOL). Soudy, N, Pessoa, S., & Dias, B. M. (2015). Building bridges through a community English literacy program for low-income migrant workers in Qatar. In J. Perren & A. Wurr (Eds. ), Learning the language of global citizenship: Strengthening service-learning in TESOL (pp. 358-395). Champaign, Illinois: Common Ground Publishing. Pessoa, S., & Rajakumar, M. (2011). The impact of English-medium higher education: The case of Qatar. In A. Al-Issa and L. Dahan (Eds.). Global English: Issues of language, culture, and identity in the Arab world (pp. 153-178). London: Peter Lang. Materials’ development for false beginner, basic, intermediate and advanced curricula for teaching English to adult migrant workers in Qatar for Reach out to Asia (ROTA): June 2013-September 2013. Access to justice by migrant workers in Qatar for the Open Society Foundations: April 2012-December 2013. Materials’ development for basic and intermediate curricula for teaching English to adult migrant workers in Qatar for Reach out to Asia (ROTA): May 2009-December 2009. Pessoa, S., Miller, R.T., Mahboob, A., Limam Mansar, S., Liginlal, D., Hagan, S., & Humphrey, S. (Submitted December 2014). SLATE-Q: Scaffolding literacy in academic and tertiary environments: The case of communication in Information Systems. Grant submitted to the Qatar National Research Fund under the National Priorities Research Program. Budget: $587,221. Status: Awarded in May 2015, start date February 2017. Kaufer, D., & Pessoa, S. (2012). Undergraduate discipline-specific writing: Expectations, demands, and development. Grant awarded by the Qatar National Research Fund under the National Priorities Research Program. Budget: $572,982. Time line: October 2012-April 2015. Dias, B., Cooper, Y, & Pessoa, S. (2011). Innovative computing and mobile technology for improving basic functional English literacy skills for adults. Grant awarded by the Qatar National Research Fund under the National Priorities Research Program. Budget: $1,049,996. Time line: June 2012-July 31 2015. Gardner, A., & Pessoa, S. (2010). Transnational labor migration in Qatar: An empirical sociological analysis. Grant awarded by the Qatar National Research Fund under the National Priorities Research Program. Budget: $600,000. Time line: November 2010-November 2013. Pessoa, S. (2009). The CMU-Q study of academic literacy: A longitudinal study of the reading and writing development of the class of 2013. Grant awarded by CMU-Q Faculty Seed Research Fund. Budget: $ 155,000. Time line: August 2009-May 2013.